We’d love your help. Let us know what’s wrong with this preview of The Reflexive Universe by Arthur M. Young. 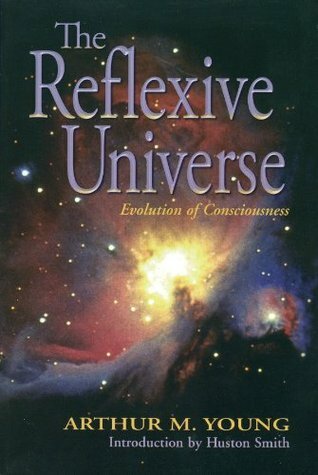 To ask other readers questions about The Reflexive Universe, please sign up. This is a very unique work that recognizes that all things in the universe can be divided into different levels or degrees of order. The general public recognizes that all things in the universe can be divided between animal, vegetable or mineral, but this book goes a step further in recognizing a pattern where there are seven degrees of order. This closely corresponds to the seven days of creation in Genesis but the author does not dwell on that subject, which is unfortunate, as this book had t This is a very unique work that recognizes that all things in the universe can be divided into different levels or degrees of order. The general public recognizes that all things in the universe can be divided between animal, vegetable or mineral, but this book goes a step further in recognizing a pattern where there are seven degrees of order. This closely corresponds to the seven days of creation in Genesis but the author does not dwell on that subject, which is unfortunate, as this book had the potential to combine science with religion. I give it four stars, because the science is out of date as it was written in the 1970s, and does not incorporate the modern findings of molecular phylogenetics. Moreover by the seventh stage of order we come to the spiritual realm, and here the author reaches the limit of his knowledge and merely describes it as "ineffable" as he has reached the limit of his knowledge. Despite the shortcomings, the author is on to something, by recognizing that there are increasing degrees of order in the universe. The idea of degrees of order is applicable throughout many different areas of science, and because of that this book could easily become a book about everything. Thus the book bites off more than it can chew. There is even a section of describing the human process as myth and this part is rather weak. The other book that I have read that recognizes different degrees of order in the universe is the work "Divine Love and Wisdom" by Emanuel Swedenborg, but as this was written in the 18th century it is even more limited in terms of proof from scientific knowledge. However that work provides an overarching basic philosophy that explains the "why" of what Young observes in "The Reflexive Universe." Thought-provoking. I'm still digesting to what degree I buy all of the theory, but it has certainly given me a new lens and I laud Arthur's original thinking. A very enjoyable, interdisciplinary, and insightful read. "Have You Become Self Aware AND Knowledgeable Of Your Limits, To Confirm That READ This Book AND It's Companion "The Geometry Of Meaning" : https://www.goodreads.com/review/show... "!"